The West Michigan area is a popular location for paddle sports. With so many small lakes and rivers, there are numerous exciting places to explore on the water. Experience breathtaking sunrises and sunsets, views of dunes, wetlands, blue skies and many forms of wildlife. What better way to spend your day than floating down the river, or exploring the edges of the lake? You'll see all kinds of critters, including many species of birds, fish, turtles, deer and so much more when exploring West Michigan lakes and rivers. Here are some great places to start exploring...click on the link to learn more about the area. The Ludington State Park is a favorite park of the area, thanks to the abundance of natural resources. Over 5,000 acres of land including wooded area, marshland, rivers, shoreline, and dunes make up the Ludington State Park. Explore Hamlin Lake and the surrounding waterways, starting from the State Park canoe and kayak trails. Read more about the Ludington State Park kayak and canoe trails. The Pere Marquette River is a favorite fishing and kayaking destination for locals and visitors alike. The moderately fast current, the clear water, and the low degree of stream bank development have all helped to make this river a mecca for those who canoe or kayak. 64 miles of river twist and turn all the way from Lake County south of Baldwin to Pere Marquette Lake and into Lake Michigan. Let's just say there is plenty of river to explore! Read more about kayaking the Pere Marquette River. The quaint harbor town of Pentwater has a variety of waterways to explore. 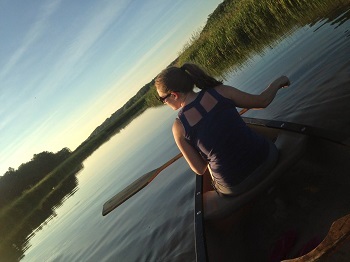 Paddle the forks, estuary, and the head of Pentwater Lake on a canoe, kayak, or stand up paddle board. Didn't bring a vessel? No problem...Pentwater area businesses are available to rent a kayak, canoe, or SUP from! Read more about exploring the waters of Pentwater. A favorite vacation spot for locals and visitors, Hamlin Lake is a wonderful destination for boating, fishing, swimming, canoeing and kayaking. Since the lake is much smaller than Lake Michigan, Hamlin Lake typically has much warmer water temperatures. Hamlin Lake offers so many neat areas to explore on a canoe, kayak, or stand up paddle board, including upper Hamlin Lake and three different bayous. Grab your vessel and start exploring! If you don't own a canoe or kayak, there are businesses on the lake that rent them. Read more about exploring Hamlin Lake on a canoe or kayak. The Manistee runs 190 miles long, and offers perfect conditions for kayaking and canoeing! Read more about exploring the Manistee River. Northern Michigan has so many varied settings for kayaking, paddle boarding and canoeing, so get exploring! Read more about Northern Michigan canoeing and kayaking.